Join us one last time this season for our Annual Winter Holiday Market! 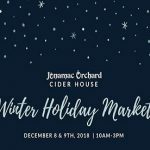 December 8 &9th from 10AM to 3PM in our Cider House. We will have handmade gifts, specialty caramel apples, and more! Enjoy a glass of warm wine, holiday sangria, or an apple cider mimosa while you shop! Plus you can grab your last Cider Donuts, Pies, Apples, Apple Cider, and Wine & Hard Cider for the season.